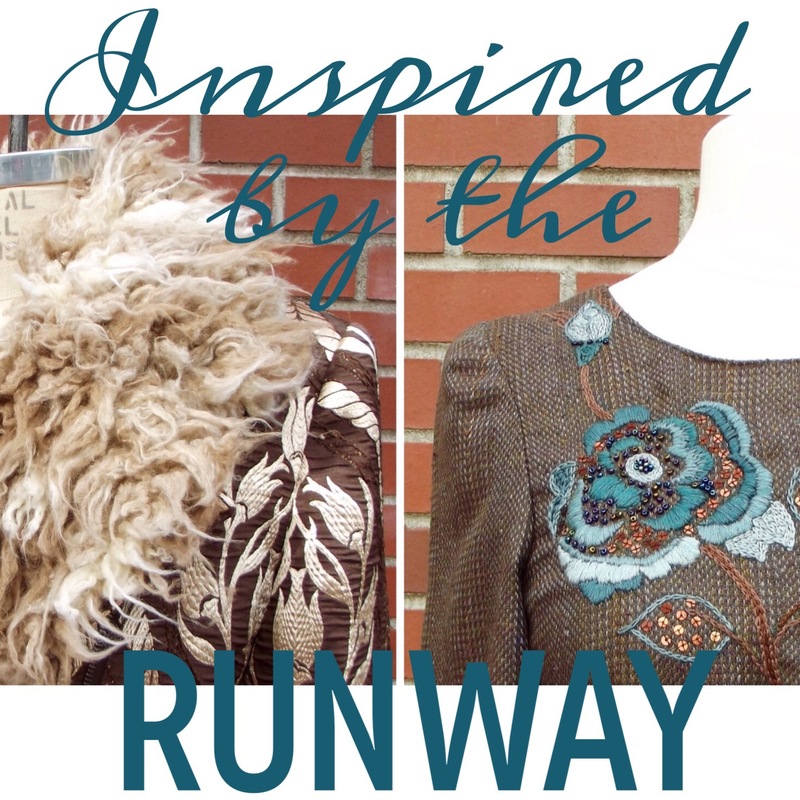 Inspired – Nancy’s takes on the runway! Our anniversary sale has come to an end, but I am excited to share with you all of the runway-inspired looks that were created by Nancy’s talented staff. Every year, the staff is given opportunity to make model garments to display during the anniversary sale. In past years, we have followed different themes: one year, everyone used the same jacket pattern and altered it to create completely different looks; another year, everyone made a frock. For the last few years, we have been inspired by the amazing fashions that walk down the runway – and attempted to recreate looks for fractions of their retail prices! This year, the designers that inspired us are Bottega Veneta, Dolce & Gabbana, Dries Van Noten, Marc Jacobs, The Row, and Tibi. Let’s take a look at the original inspirations, talk about the fabrics and patterns used to create our own looks, and see the finished garments! Marilyn was inspired by this Dries Van Noten jacket, shown here styled by Barneys New York. To create her version of this jacket, Marilyn started with KwikSew 3764, which is the pattern used in the Motorcycle Jacket class taught by Jacque Goldsmith. 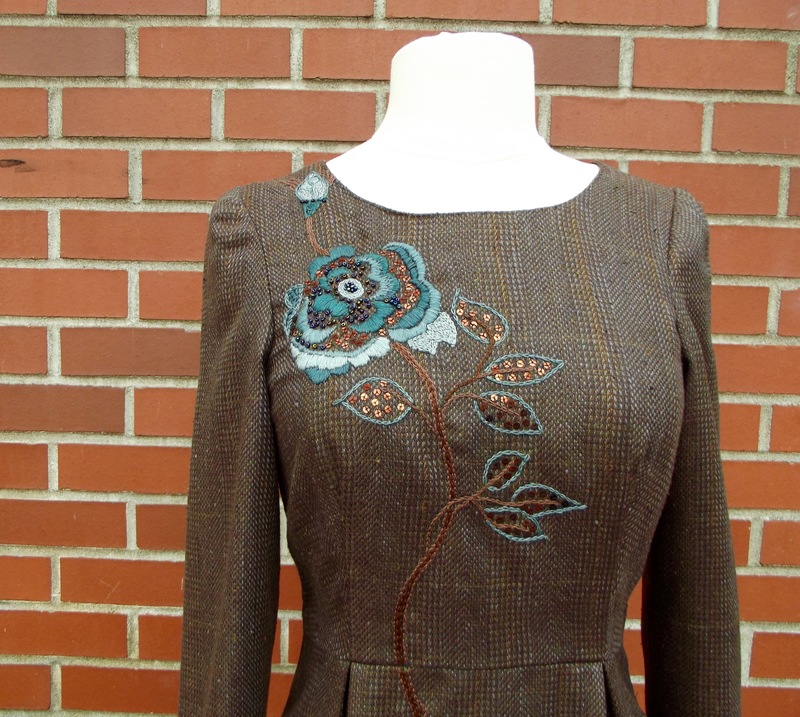 She altered the pattern to add length, make the collar bigger, and create a two-piece sleeve. 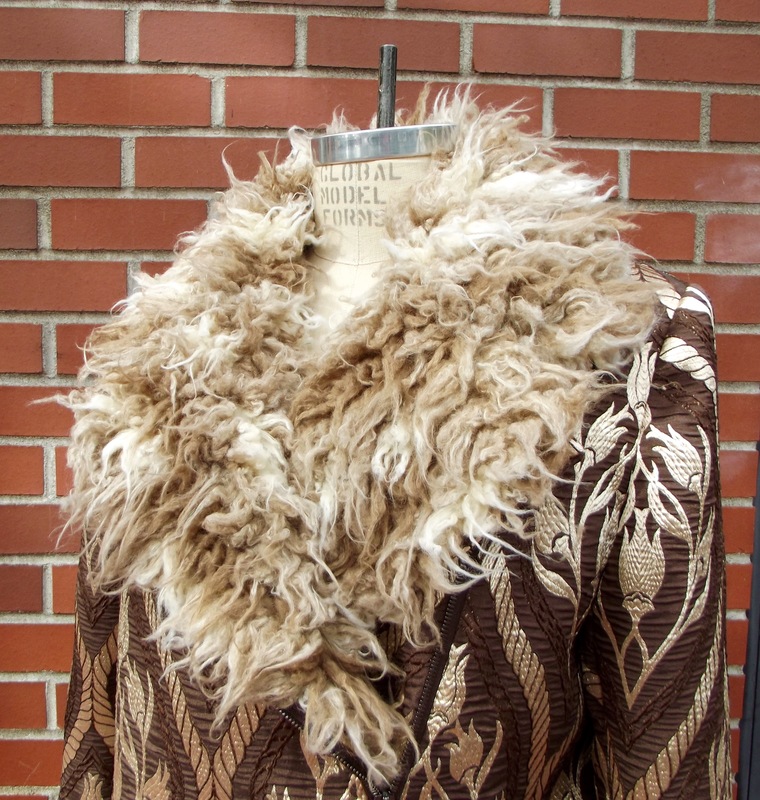 For fabric, Marilyn used a 100% polyester jacquard for the body and African Mongolian faux fur for the collar. 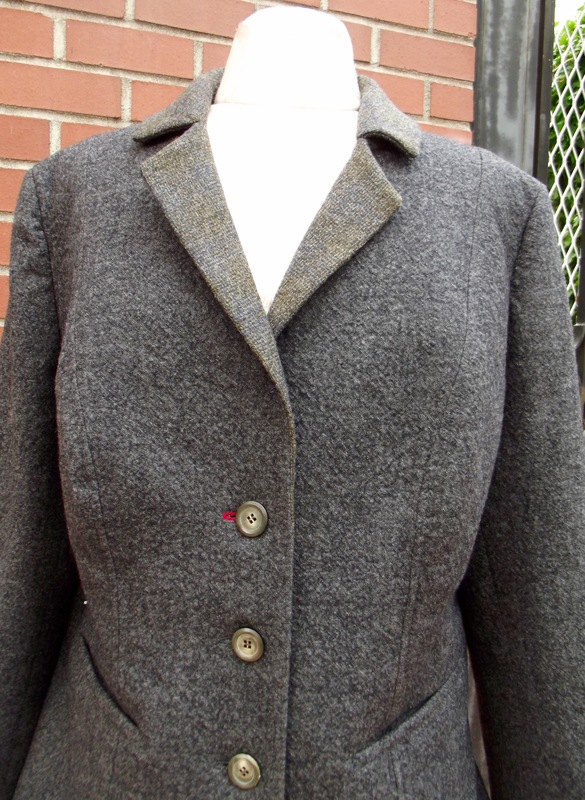 She underlined the jacquard with 100% cotton flannel and lined the jacket using a warm back winter lining. The original Dries Van Noten jacket retails for $1,745. Marilyn made hers for $103! Jeannie wanted to make a ‘tribute’ dress based on Dolce & Gabbana’s “Viva la Mamma!” collection. She used McCalls 5927, a now out-of-print pattern, which features a fitted bodice and skirt with pleat detail, similar to the silhouettes shown on the D&G runway. Jeannie selected a silk & wool blend suiting in a subtle brown/grey plaid for the dress and fully lined it with rayon Bemberg lining. To really pay tribute to “Viva la Mamma!” Jeannie embroidered a rose motif on the front of her dress. After sketching out a rose design, she drew it directly on her fabric using a metallic pen. She then embroidered over the design, embellishing it with copper colored sequins and iridescent blue beads. 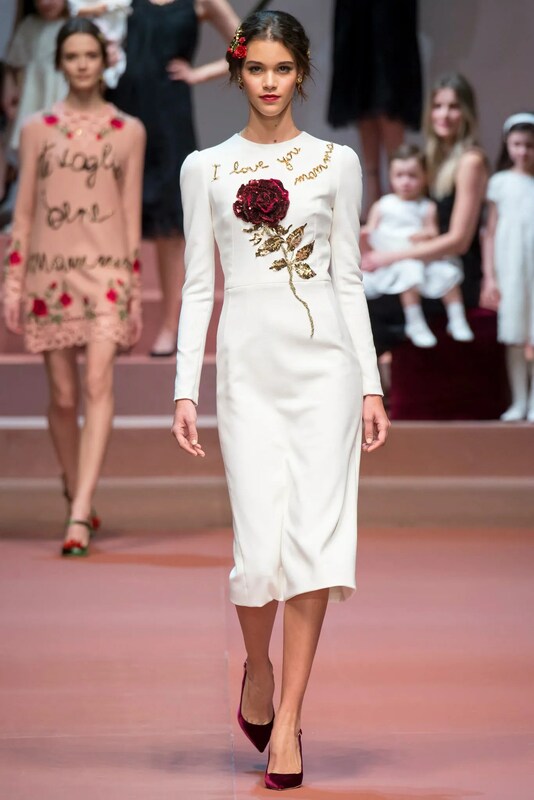 The Dolce & Gabbana dress shown above retails for $6,995. Jeannie’s version cost just $75! Chris loved this jacket by The Row, with its cropped sleeve, longer body length, narrow lapel in contrast tweed, and one red buttonhole. Using Burda 6842, Chris was able to capture the essence of the original style. She worked with Jacque Goldsmith to alter the pattern, shortening the sleeve and updating the lapel, ultimately creating a garment that is flattering to her figure. 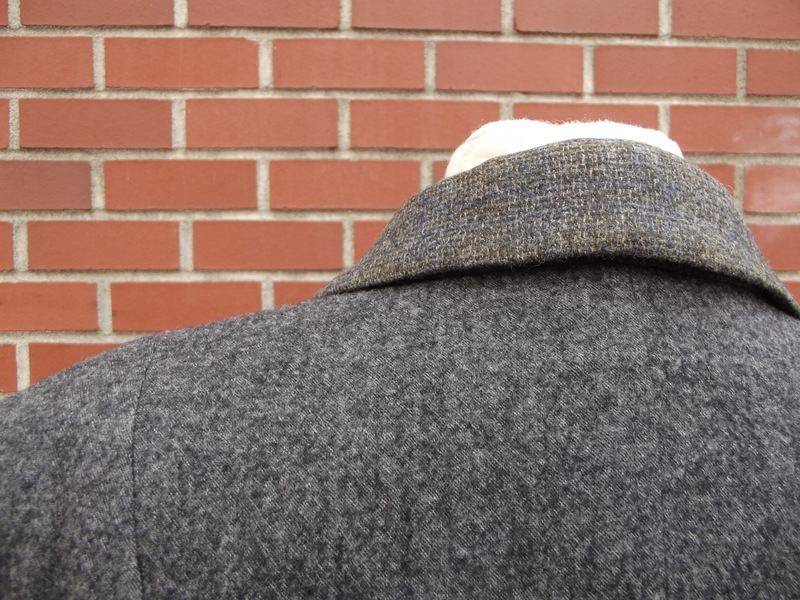 The original jacket is made of double-faced wool and silk; to achieve a similar look, Chris paired dense felted wool with lighter-weight wool tweed. For the single red buttonhole, she used silk thread. The Row jacket retails for $4,090. Chris made her version for $176! 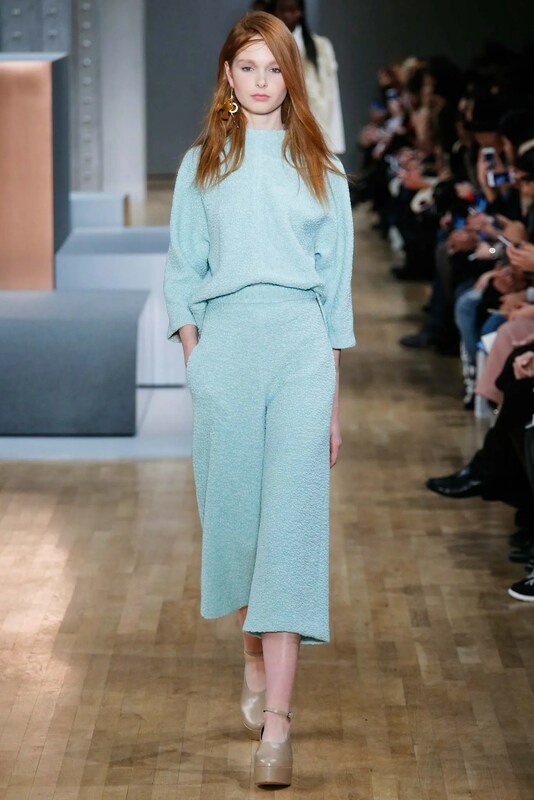 Prompted by the prevalence of the ‘match set’, Ellen was inspired to make her own version of this Tibi ensemble. For the top, Ellen used Butterick 6134, altering the pattern for a straighter fit. She selected Butterick 6178 for the pant. Ellen chose lovely wool suiting in slate blue with a pale stone woven motif for her match set. While neither of her selected patterns includes linings, she opted to add them to each garment. She underlined her top and created a regular lining for the pant. The original Tibi ensemble retails for $1,300. Ellen’s version was made for $150! 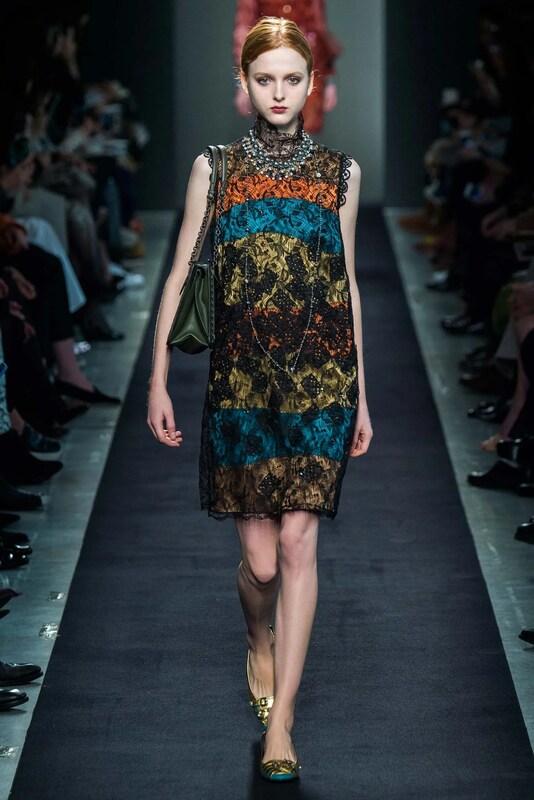 Two of the Nancy’s employees were inspired by the styles with black lace overlays shown at Bottega Veneta. Izzie liked the idea of a dress with sleeves and was intrigued by the shaping created by the seams of this dress. To create her version of the look, Izzie made two separate dresses, using two patterns. She used Vogue 8944 for her overdress, altering the shape of the waistline. For the underdress, she used McCalls 7014, adjusting the neckline to better work with the overdress. She selected printed cotton broadcloth for her underdress and a sheer patterned fabric for the overdress. Jessica loved the simplicity of this dress silhouette and the effect of layering a delicate fabric over sporty stripes. To recreate this look, Jessica used Burda 6914, which features the same rounded silhouette as the runway look. She lengthened the pattern and adjusted for size. Jessica selected a rayon quality with a reflected digital print for the under layer and opted for a lace with metallic motif for the outer layer. For the trims, she found a piece of geometric black lace. She used the rayon as an underlining, sewing both layers as one. Because the pattern features a pleated detail at the neck, she opted not to add a lace collar per the inspiration. These two dresses look pretty great together! The Bottega Veneta dress that inspired Izzie’s dress retails for $7,600. Her version cost less than $100 for both dresses! The dress that inspired Jessica’s version retails for $11,000. Including pattern & thread, her dress cost just $112! 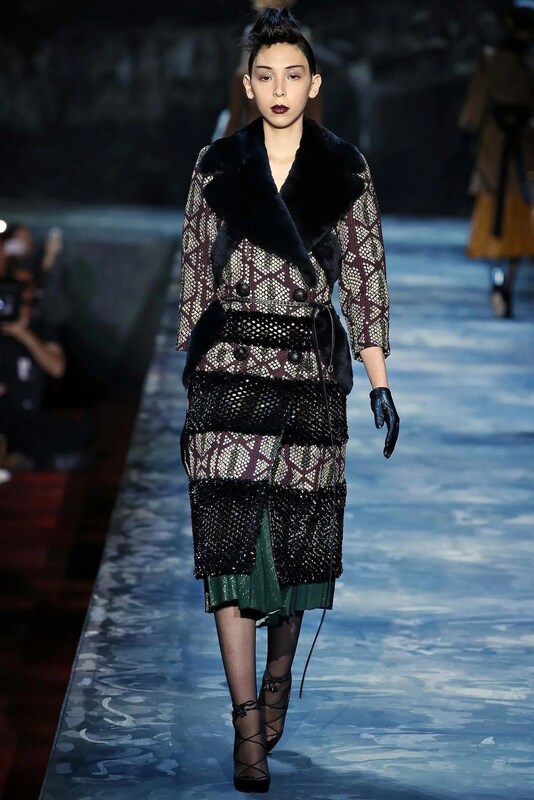 Kitrina’s ensemble was inspired by many elements from the Marc Jacobs collection, including mixes of fabrics, like the use of sheer fabrics combined with opaque, tailored silhouettes, luxurious textures, and beading & sequins. Ultimately, Kitrina chose to make a box-pleat skirt that explores the opaque/sheer concept, a tailored double-breasted jacket, and a blouse with a band of sequins. For her jacket, Kitrina used McCalls 8346, lengthening the jacket body and letting out the waist slightly. The blouse was made using KwikSew 3601; Kitrina altered the neckline and shortened the tunic body. Kitrina based the skirt on Burda 8155 (this is the pattern used for our Pencil Skirt Secrets class), reworking the shape to allow for the box pleats. Kitrina selected burnout velvet in a purple/grey wild cat motif for her blouse and black sequined mesh for the band at the hemline. For her skirt, Kitrina used an olive/brown/navy plaid wool suiting for the outer pleat and black mesh with metallic dot for the inner pleat. Her jacket was made from a wool suiting – navy pinstriped in brown – using black mohair for the contrast collar and faux pocket flaps. 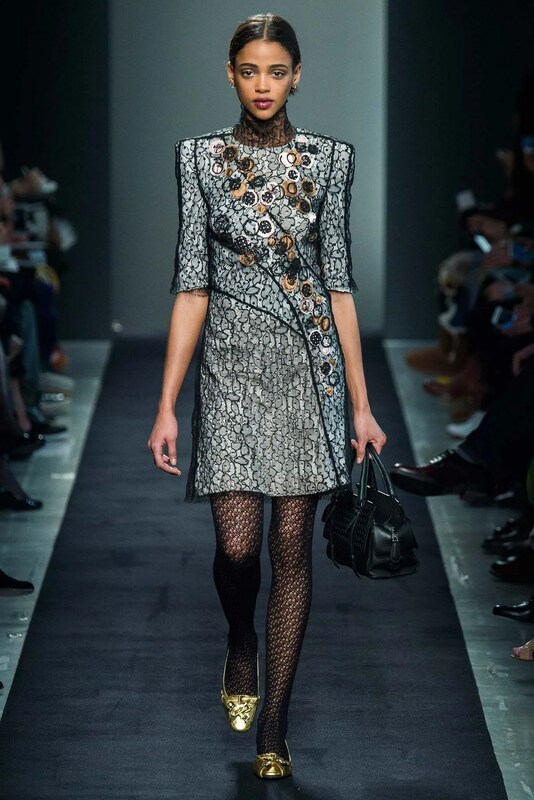 A similar ensemble from Marc Jacobs retails at $7,500. Kitrina was able to make her version for about $493! I hope you enjoyed this look at our runway-inspired garments! Have questions about any of the looks? Leave them in the comments below! As August begins it’s descent into September, we are beginning to think about changing leaves and autumn wardrobes. While this summer in Seattle has been incredibly beautiful and sunny, we would be lying if we said we weren’t excited for a little fall drizzle. Hi, I am the wool department. I live in the center of the store, toward the back. I used to reside in a long row of tables in the back right section of the store, but since we rearranged, I am now in a cluster by the main walkway. I’m enjoying the brightness of being under several skylights. The new location is arranged in a way that is fabulous for browsing. 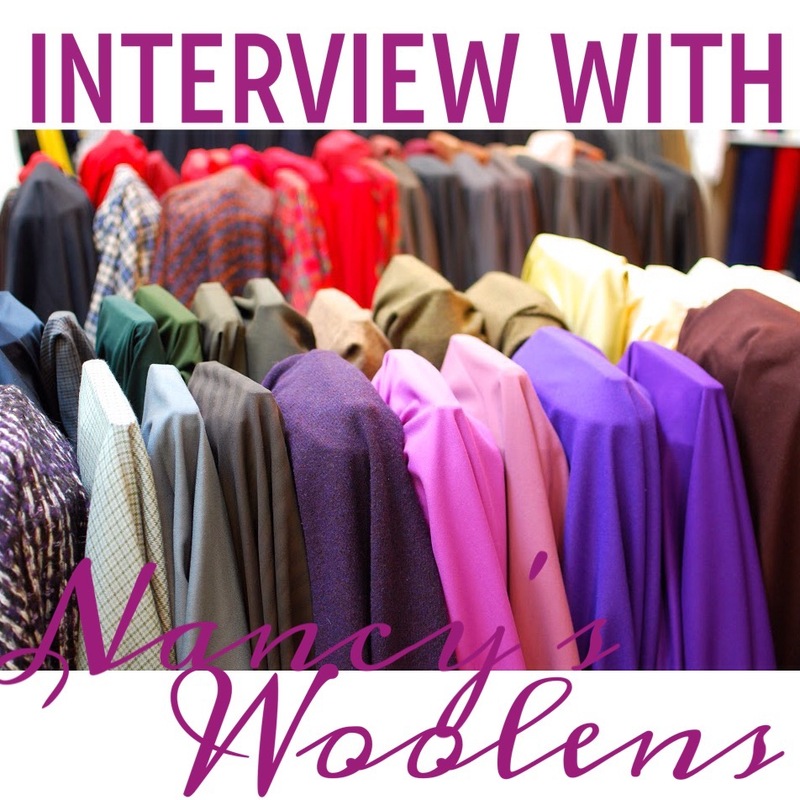 I house all of the woolen and woolen-blend fabrics, both woven and knit, which are perfect for suiting, coats, dresses, skirts, and more. I am also home to all of the specialty animal fibers, like cashmere and camel hair. 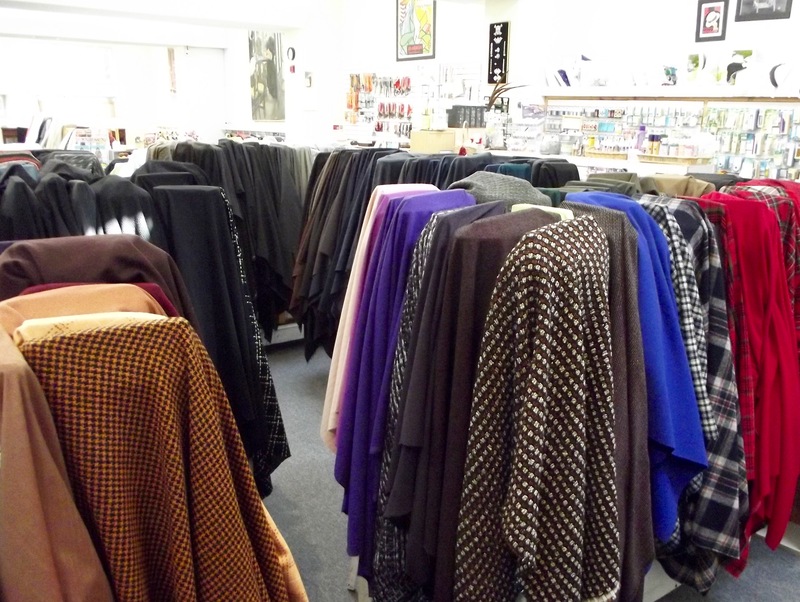 In preparation for the fall season and the Nancy’s anniversary sale (which begins on Labor Day…), we just received a large shipment of woolens. We got in a lot of beautiful basics and interesting novelties. Among the latest shipment is a small grouping of 100% wool crepe, fiber-dyed in the prettiest colors. Each color way has an interesting depth of hue. 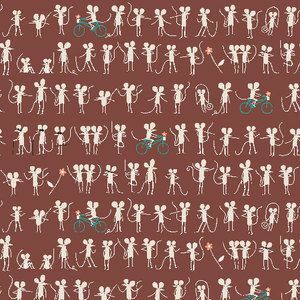 I think they would make a lovely dress or match set, like a tailored woven tee and a pencil skirt. 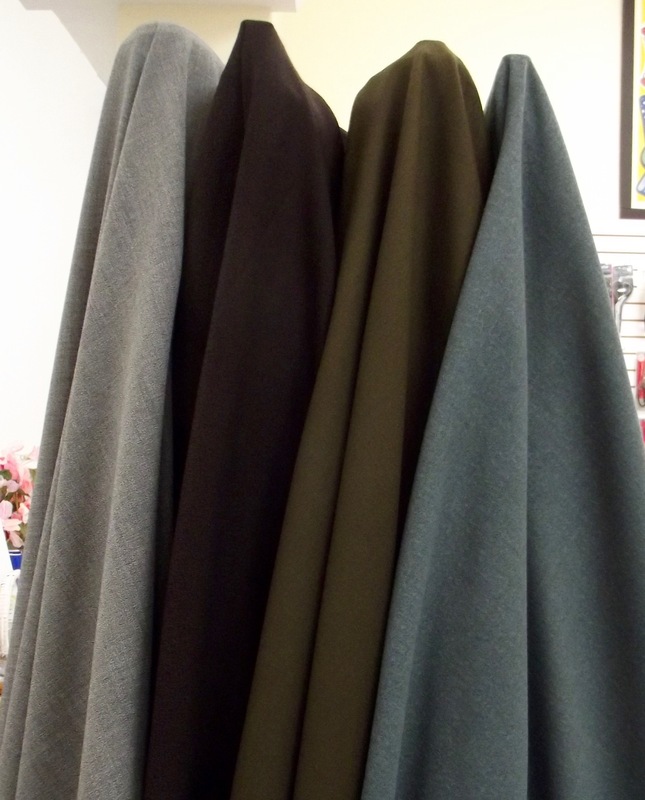 New wool crepes in exquisite colors: grey, brown, olive, and blue-grey. Another interesting piece that arrived in the latest shipment is a twill-weave coating with a brushed surface that is comprised of 65% rabbit hair 35% wool. I believe the fiber is Angora rabbit hair, because it has the softest hand. It is incredibly luxurious and would make a sumptuous winter coat. Three bolts of brushed woolen fabrics made with specialty fibers. 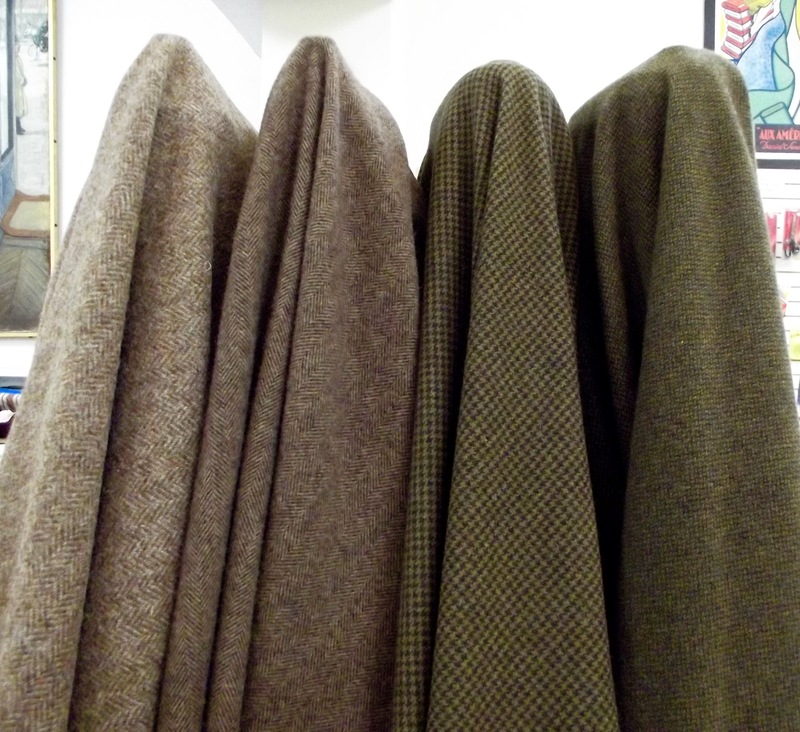 From left: black fluffy mohair/wool, black rabbit hair/wool twill, and brown heather wool/cashmere/mink. 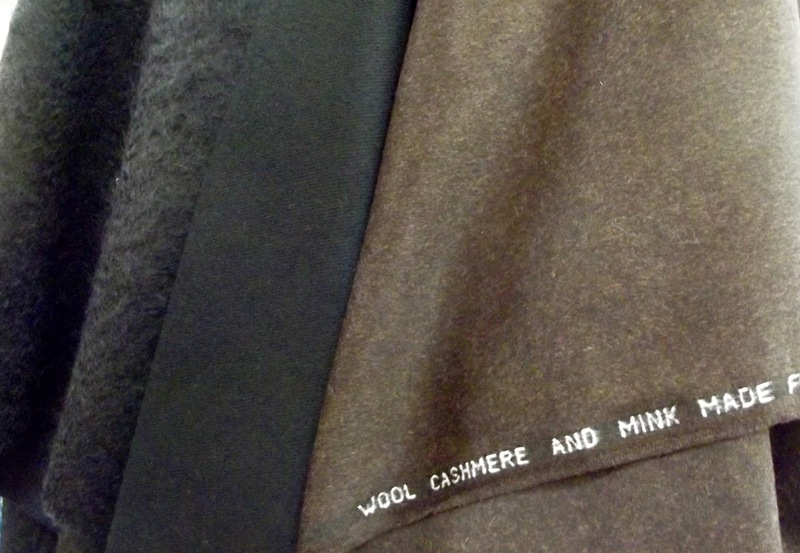 I am a big fan of the Italian 100% cashmere coatings that we carry. We have solids and patterns, all of which are simply gorgeous. 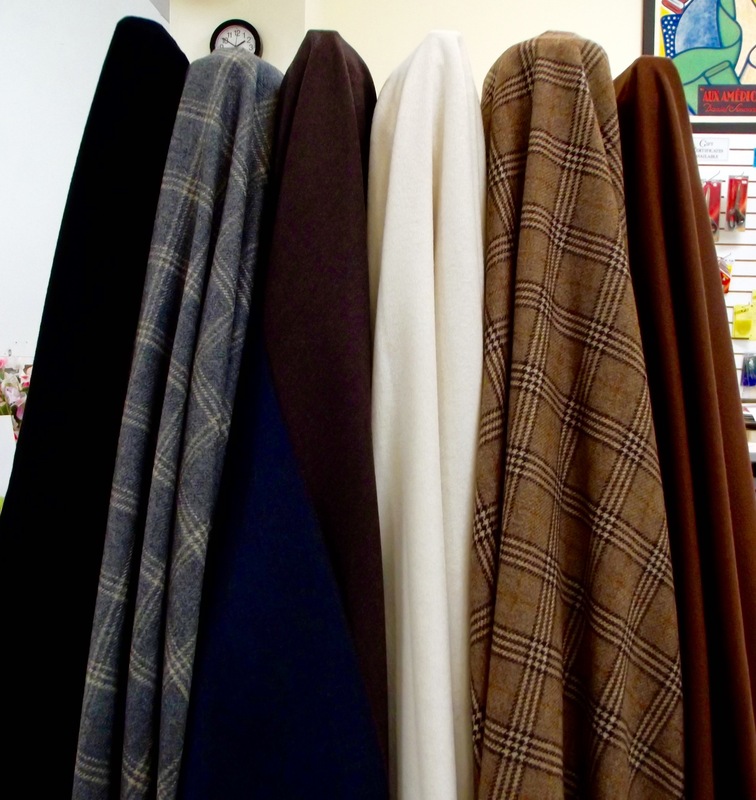 Incredible Italian cashmere in beautiful solids and exquisite textures and patterns. We also have a nice selection of real Harris tweeds. Harris tweeds used to be narrow and very stiff, but we are lucky enough to carry what I think of as the ‘new generation’ of Harris tweeds: beautifully finished with an incredibly soft hand and 60″ wide. Gorgeous Harris tweeds! These are just begging to be tailored into a hacking jacket or a lovely little skirt. This could easily be a very long list. We have sold so much wool throughout the years! Right now, I am excited to see what the staff at Nancy’s creates for display during the anniversary sale. They are recreating several runway looks and many of them are using wools. 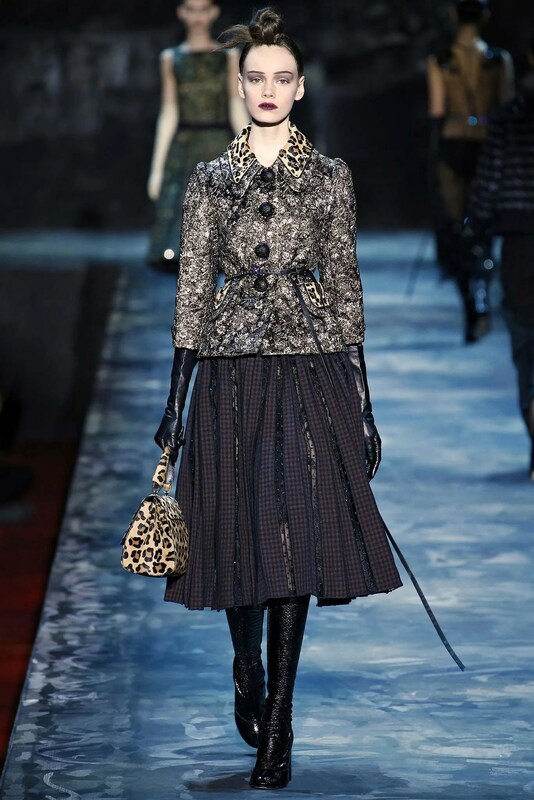 I know there will be a D&G-inspired dress and a Marc Jacobs-inspired jacket & skirt ensemble, among others. It will definitely be worth a visit to the shop when the sale is on to check out the different looks! Thanks, woolens! We are also excited to see how the runway looks turn out! If you have any questions about materials shown in this post, let us know in the comments below, or by calling us at 206-282-9112 or 800-443-2964. All pictures in this post copyright of Nancy’s Sewing Basket, LLC. Special thanks to Kam Martin for taking the picture used in the header. 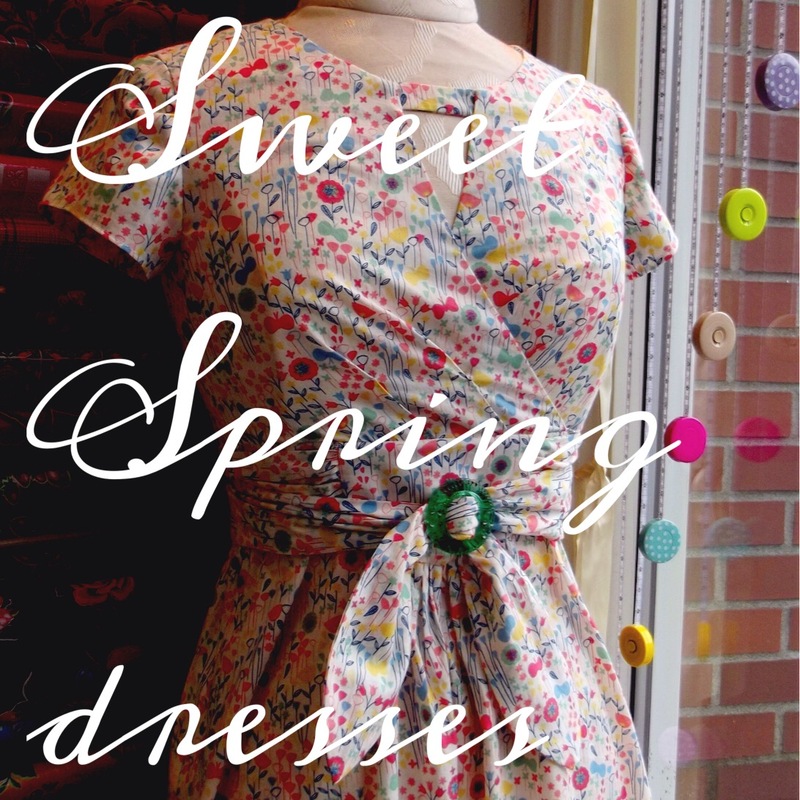 The sun has been shining in Seattle and I am dreaming of making a new spring dress! We have so many wonderful new fabrics coming into the shop in sweet prints, cool near-solid textures, and fun colors that it is hard to resist buying them all. Adding in all the lovely new dress patterns that have been released makes the temptation even greater. There are lots of fabulous styles to explore: vintage-inspired, easy shifts, fit-and-flare, shirt-waist, classic sheaths…and the list goes on! To celebrate the new season (plus fabrics and patterns), we’ve made up a couple dresses to share. The first dress is a new pattern from the Lisette capsule collection released by Butterick. It’s a great fit-and-flare style that feels both modern and retro at the same time. The original dress pattern doesn’t have ties, but we elected to add the sash from the pattern’s tunic style. 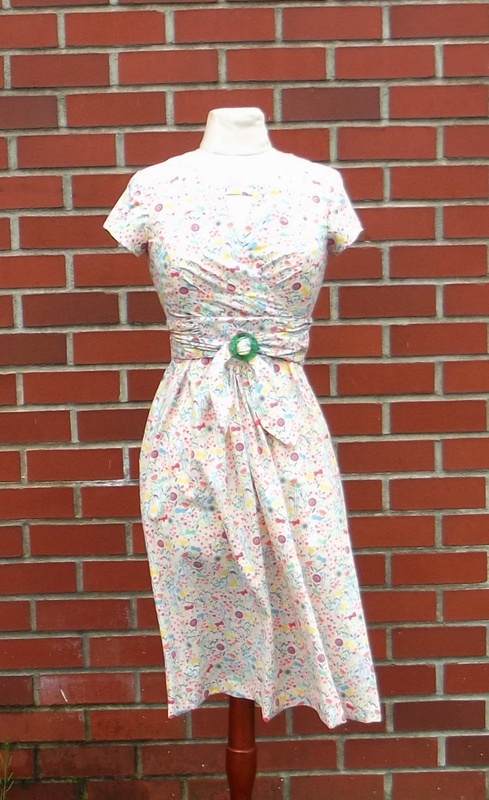 We made it up in a sweet cotton lawn print and added a vintage glass buckle for the perfect finish. The bodice has a beautiful cross-front detail and triangular cut-out at the neckline for a sweet hint of skin. Our second dress is a new pattern from McCall’s. It has a great casual feel to it: an easy fit bodice with button details and dolman sleeves, plus a tiered skirt for a little fun. We’ve added a sash at the waist for a bit of definition, but think this would be so sweet with a contrast belt! 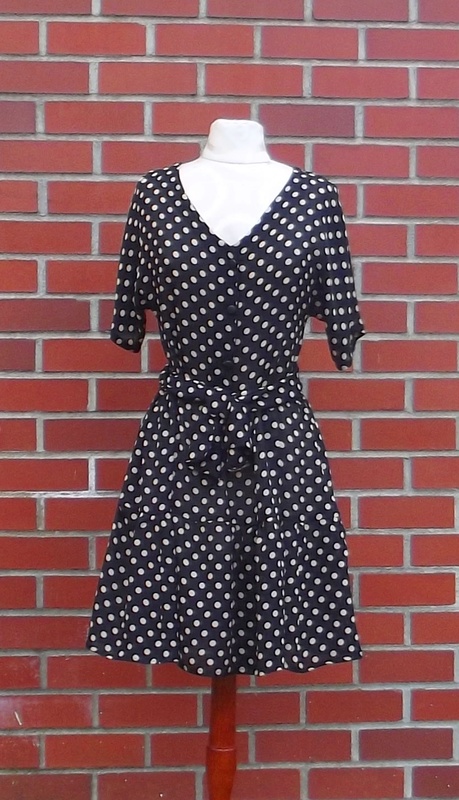 We made this pattern up in a classic polka-dotted silk crepep-de-chine, for a touch of elegance. Pairing a simple print with these fun style lines just makes this dress sing. Do you have a favorite style of dress to make? Tell us about it in the comments!